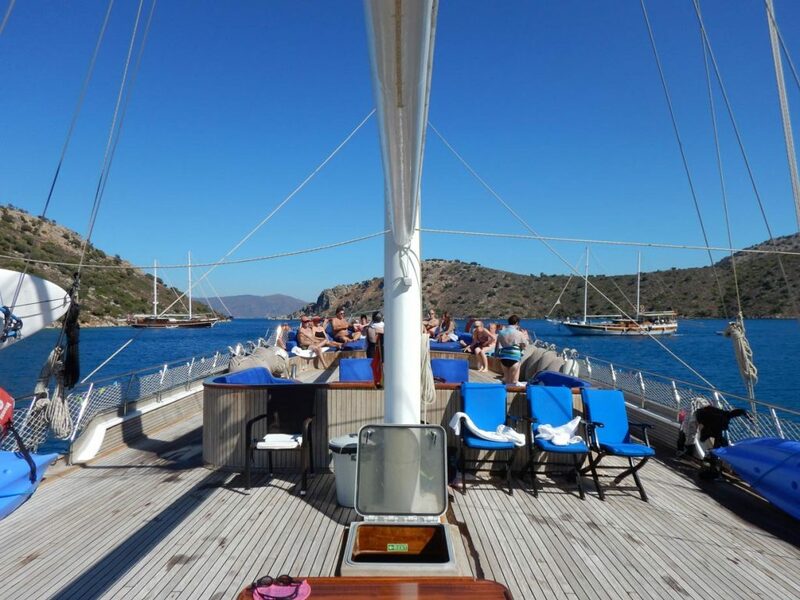 Our Swim-Sail trip with Strel Swim Adventures off the coast of Turkey was the most relaxing and exhilarating vacation we have experienced. Our expectations were exceeded on so many counts: quality of guides, fellow swimmers, boat accommodations, and the water we swam in. This article is written by our guest Dorothy from the USA. Borut Strel, company owner and guide, is an exceptional person and an exceptional guide. His youth belies his breadth of experience organizing swim adventures. Day one he divided us into skill levels. Day two he put on weights and descended below water to photo us one at a time as we swam over him. That night he gave us each constructive feedback on how to make our strokes more efficient. Day three he flew his drone and photos us one at a time from above. Again that evening he gave us even more helpful tips. He is encouraging, calm and genuine. He often asked our opinions and checked in on our needs. His assistant, lovely demure and supportive Laura, oversaw that we swam safely. 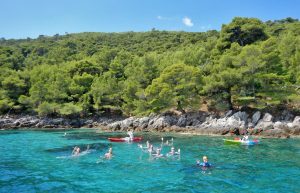 Both Borut and Laura lead or followed our swim groups in dinghies offering water breaks and juice as needed. They had supplies of fins and paddles to help correct one’s stroke or increase speed if desired. Before each swim, Borut pulled out the vaseline to lubricate any skin at risk of getting chaffed from frequent usage. There was no pressure to swim, however. 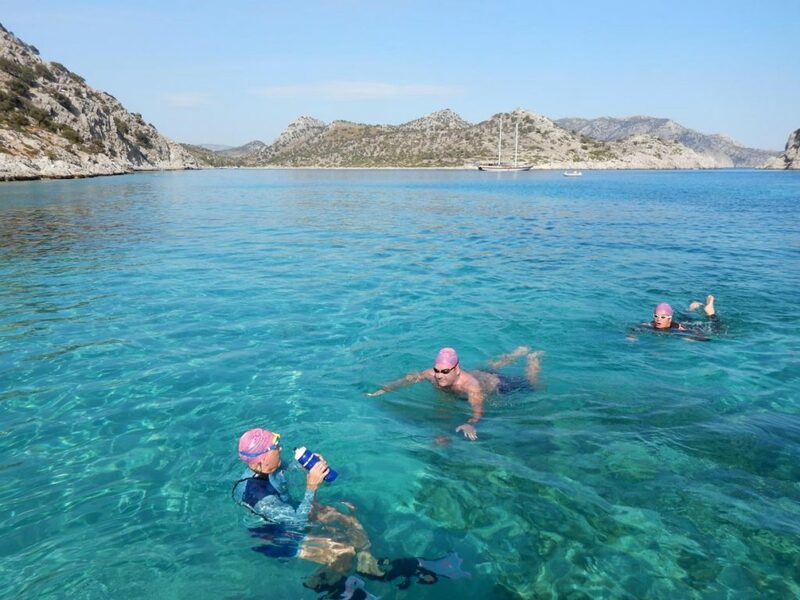 It is a trip for all skill levels from bathers to serious triathletes. 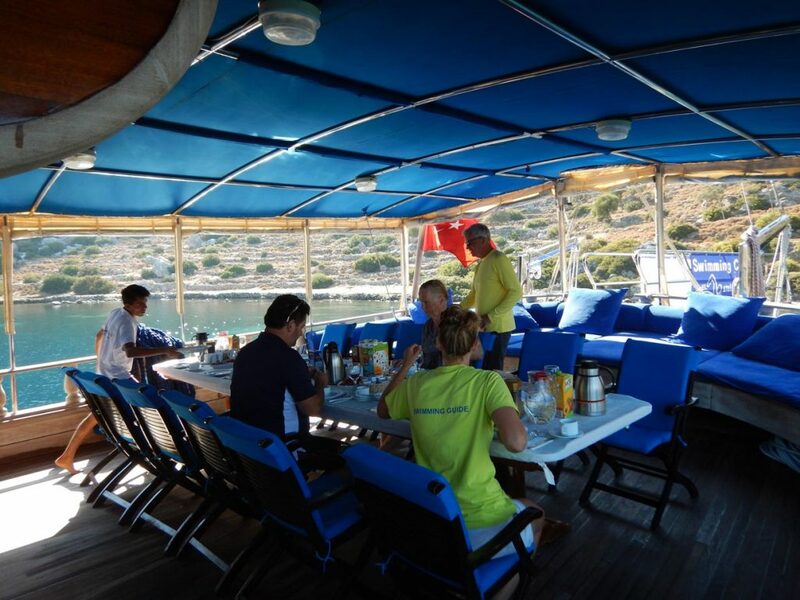 We could relax on board or take out a kayak or windsurfer. And even with logistical concerns (passports, tickets, change of flights) Borut expertly assisted us always being there to take care of our needs. It follows that a high-quality company attracts a high quality of guests. This young company already had three repeat guests of the ten of us on this trip. Our trip was 4 couples and two singles from a mix of South Africa, Australia, England, Canada and USA. Other trips have quite a different mix, but commonalities tend to be the same: upbeat, personable, playful, and energetic folks. From our fellow adventurers, we learned how to eat a soft boiled egg through a hole in the top of her shell, do a triathlon with no practice, learn to sail late in life and then sail across oceans, buy a handbag for a fraction of the listed price, celebrate a 70th birthday in style… Together we stretched, practised yoga together, read, played games, laughed, shared vacation stories, napped and basked in the glory of our swim trip. 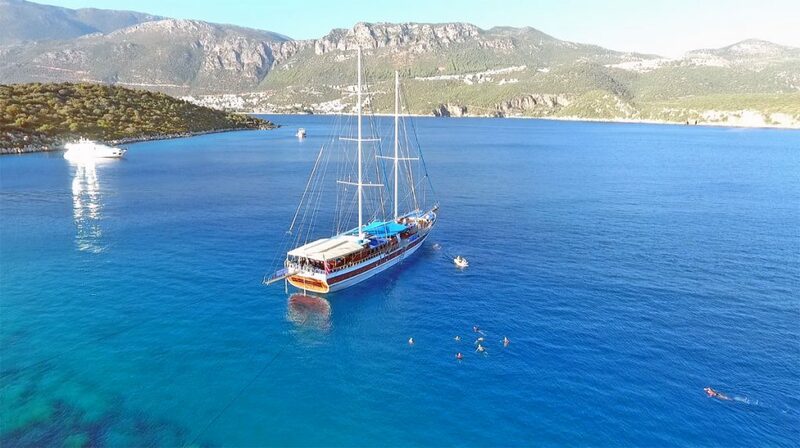 Our 120-foot (37 meters) Turkish gulet sailboat was luxurious and an absolutely perfect venue for our activities. 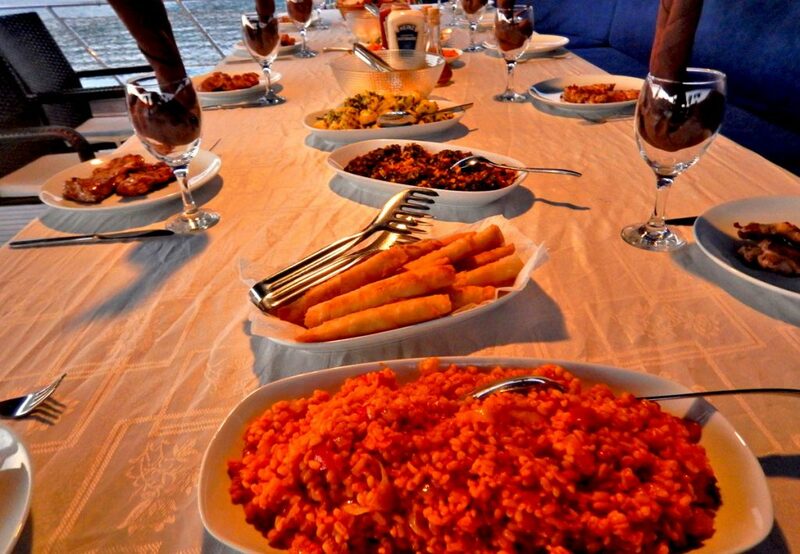 Two giant tables were the meeting place for all meals, one fore and one aft. There was always space for us to be in the shade, the sun, or in the lee of the wind, in private space, or group space. Our beautiful staterooms included private baths. We were above deck during our October trip for every minute of the day, excluding sleeping. The boat is so stable that it never rocked. Those worried about seasickness were very relieved. And when we stepped off of the boat after a week, we had no sense of sea legs. Swim, Sail, Cruise, Repeat. That’s what we did for a week! The water was so clear and clean. Borut always guided the boat and our swims away from the wind and the chop. The temperature was a pleasant 75 F (24 C). 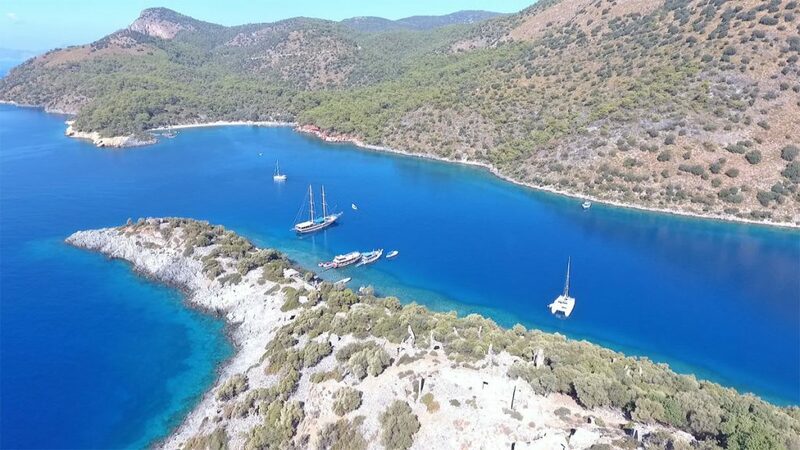 We swam most often in coves near unpopulated islands without risk of motor boats. This Strel Sailing trip has spoiled us. We have a new standard of vacationing!! We are planning a return trip as we write. 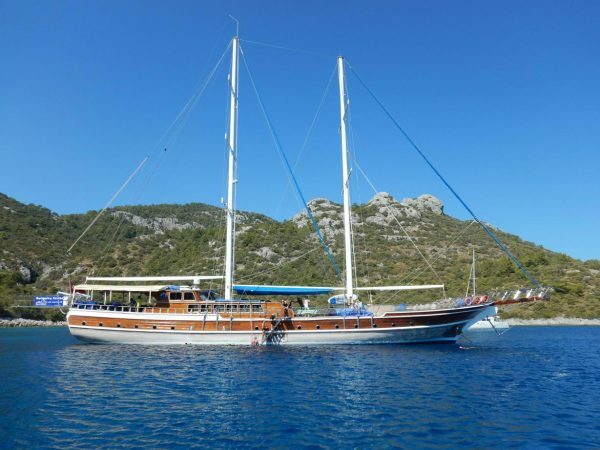 Our guest Dorothy travelled with us in October 2017 on a trip Turkey Swim Sail Cruise.